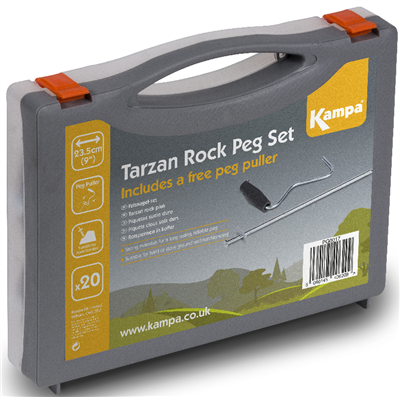 Kampa Tarzan Rock Peg Pack comes complete with carry case. This peg is made from tough steel with a T-bar for easy securing of guylines. Ideal for rocky or hard ground. NEEDED PEGS CAPABLE OF COPING WITH STONEY CONDITIONS AND THESE FIT THE BILL EXACTLY. Very useful stuff of pegs. They seem strong.